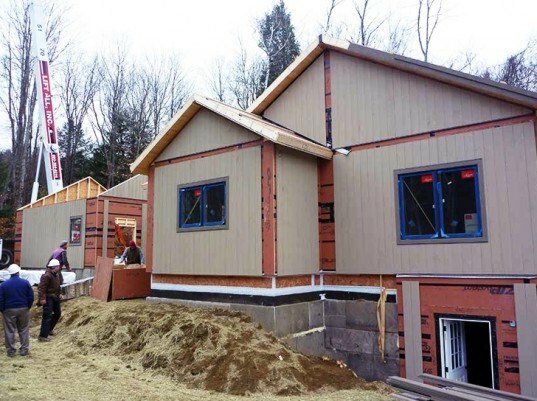 The innovators over at Unity Homes have constructed their first Xyla prefab home—in just three days! 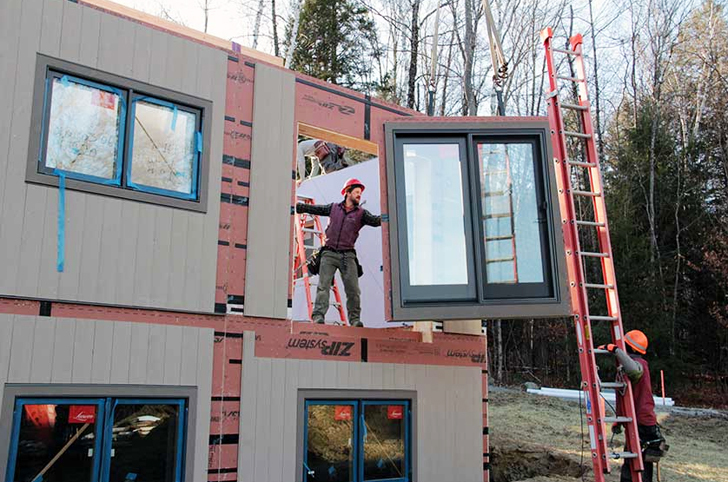 The first of these homes popped up in Vermont last week, and was easily assembled with a crane and small construction crew. Transported in flat packs on trucks, the home is a cost- effective and energy efficient prefab home for comfortable living. The Unity Home model is broken down into panels, making the materials easy to ship anywhere in simple flat packs. Saving money and carbon emissions, an entire home can be transported in just one shipment. Once unpacked, assembly of the flat packed pieces requires a smaller, and there for less expensive crane to put the panels together. To save even more time, Unity’s two story model’s siding is installed off site. Decorative trim ties the side panels together, giving the exterior a cohesive look—rather than a façade of panels hooked together. The panels are assembled on a traditional timber frame, which peaks in the center like an ordinary home. The flat packed panels are them assembled around a pre-dug concrete foundation. What makes the Xyla prefab home so special is its upgradability, which provides home owners with options at every price point. Abundant windows and glass doors give the home a light and airy feel indoors. Only the interior finishes are installed on site, and are customizable to the resident’s needs and preferences. The Unity Home model is broken down into panels, making the materials easy to ship anywhere in simple flat packs. Saving money and carbon emissions, an entire home can be transported in just one shipment. Once unpacked, assembly of the flat packed pieces requires a smaller, and there for less expensive crane to put the panels together. Saving even more time, Unity’s two storey model’s siding is installed off site. Decorative trim ties the sided panels together, giving the exterior a cohesive look- rather than a façade of panels hooked together. What makes the Xyla prefab home so special is its upgradability, giving home owners options at every price point. Abundant windows and glass doors give the home a light an area feel indoors. Only the interior finishes are installed on site, and are customizable to the resident’s liking. The affordable and customizable Xyla home would only be better with the installation of green technology- making it an incredible and comfortable green home that can pop up in just days.